Churrigueresque is a style of ornamentation used in Spanish Baroque architecture. The word comes from the Spanish architect and sculptor José Benito de Churriguera. It is characterized by lots of detail and elaborate combinations of curved surfaces. 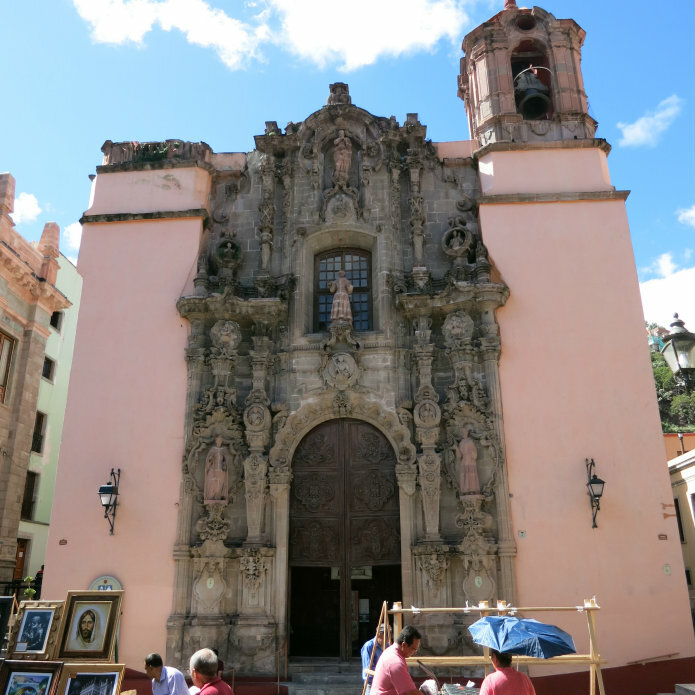 The facade of the Church of San Diego in Guanajuato, Mexico is ornately decorated in a style known as Churrigueresque. 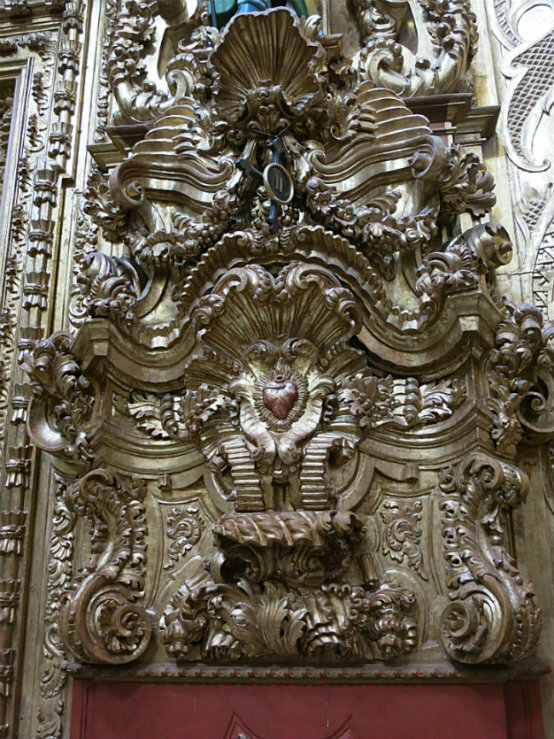 This is a common form of architectural ornamentation in Baroque buildings in Mexico. It developed in Spain, but found its widest and longest period of popularity in New Spain. 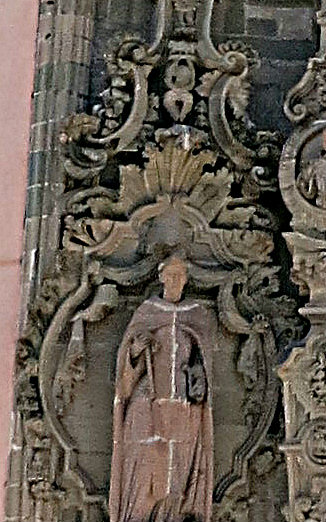 In this example to the right the common statue of a saint is given an elaborate backdrop of scrolled drapes, leaves, volutes and various details too small to make out for a part of the facade that was a good 30 feet up in the air. Even though the detail could not be made out, part of the intended effect was the creation of shadow and texture, which could be seen from a distance. Here is another example. This is from the interior of the Monastery of Santa Clara de Jesus in Queretaro. There is so much going on here that it is difficult for the eye to settle on one thing. Part of the Baroque aesthetic was to create the illusion of motion. The Renaissance was all straight lines and rational thought. The Baroque emphasized curves and emotion. Churrigueresque attempts to achieve this through multiple layers of overlapping activity. One of the defining elements of Churrigueresque is the use of estipite columns. These are columns that are inverted cones or obelisk. Often they are sectioned into multiple parts with curved transitions between the sections. Generally these are not supporting columns for the roof, but are usually decorative. They are often used as on facades or used for framing niches and altars or other areas that might be set apart through architectural elements. Like Me! Tweet Me! Comment! Tell your Story!